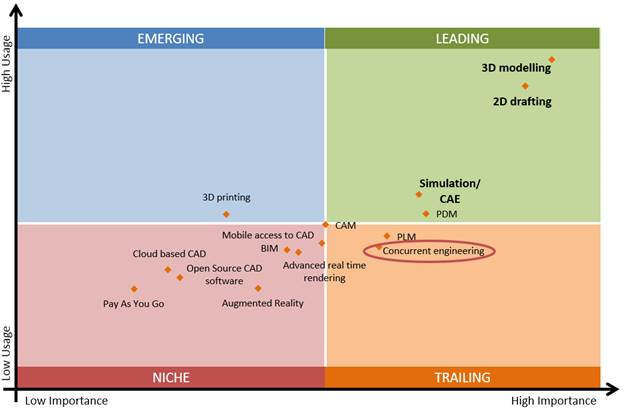 This post publishes more specific details on the Concurrent Engineering Trend from the Worldwide CAD Trends 2016 Survey. 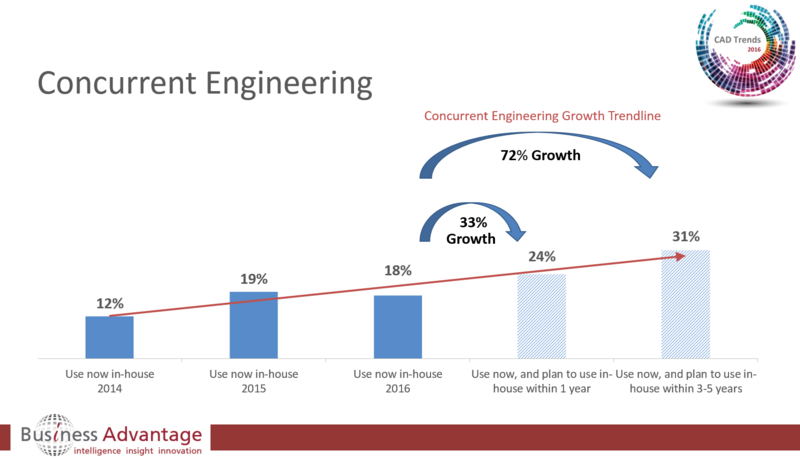 For Concurrent Engineering the growth predicted in the 2015 report did not materialize – usage has remained flat (19%-18%) through 2015. Users continue to rate its Importance highly – it is the 6th most important CAD trend from the survey. Like PLM, Concurrent Engineering is a trailing trend – high importance coupled with relatively low usage. However users continue to predict growth – 33% this year (from 18% to 24% usage) and 72% within 5 years (from 18% to 31%). Awareness of Concurrent Engineering is 52% in large companies, 45% in medium sized companies and 39% in small companies. Similarly, Usage is higher in large companies (28%) than in medium sized companies (17%) or small companies (9%) and long term future predicted usage is also higher in the larger companies. Usage is highest in North America (21%) compared to EMEA (16%) or APAC (14%). The leading reason given for not using Concurrent Engineering was incompatibility with existing systems which is obviously a prerequisite for multiple users working on a single model real-time. There is further indication in the survey of greater growth potential – a separate but related survey question asked what collaboration, data and information management tools respondent’s use? The top 10 leading software tools by market share (current usage for these purposes) are listed below. The highest market share for a single software solution is just 12% and there is no clear market leader although from a vendor point of view Autodesk leads with 5 of the top 10 software solutions! Also, in answering the question above, 50% either did not use these tools or could not say which brand was used (41% selected “Do not use any” and 9% selected “Don’t know/cannot say”). Looking more deeply, the “Do not use any” answer varies greatly by company size – 12% in large, 49% in medium, 58% in small. Naturally the report is a high level summary of insights gained from the data gathered and this series of blog posts enables us to add further detail but if you are interested in still more detail, such as information on Concurrent Engineering usage or growth predictions by region or industry, give us a call to chat with a research executive about your needs.